Over the past one and a half weeks since our arrival in India, our team has been hard at work developing and fine-tuning our survey instruments. 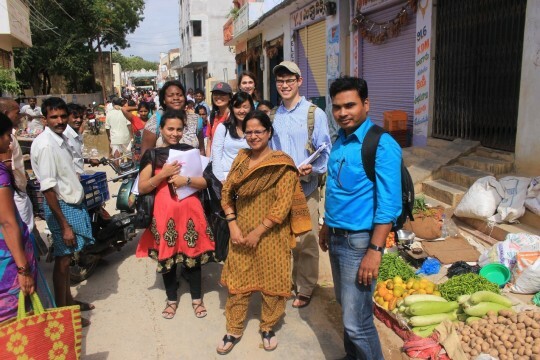 Building on the MNDA pilot completed by TCi interns last year, our team aims to expand the information collected about dietary diversity at the individual and household level and also gather market-level dietary diversity (MLDD) data on food availability and affordability. With our tools in our bag, we were finally ready to hit the road to pilot test our market level dietary diversity module. 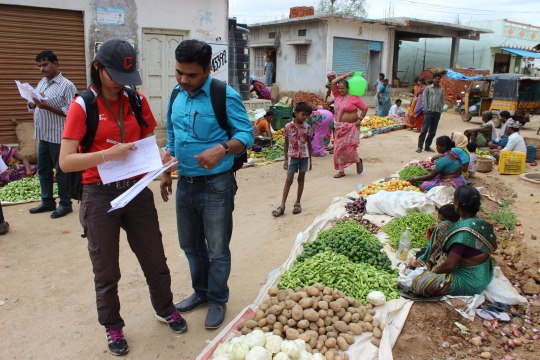 To visit the weekly market place, we travelled to a village in Telangana State located about two hours away from the ICRISAT campus. The market place was a flurry of activity, with vendors setting up shop by the roadside while swarms of people and vehicles swept by. Amidst this hustle and bustle, our team came up with a game plan to divide and conquer the market place. Working in teams with our indispensable investigators from ICRISAT, we split ourselves into individual task forces. I worked with my investigator Duche to conduct a market level inventory of food items sold. This was a useful exercise in allowing our team to quantify the availability and popularity of individual food items, and it definitely helped to expand my vocabulary on vegetables and fruits. I also had a chance to profile a vegetable vendor, and had a better understanding on the seasonal availability of her goods and her sales volume. 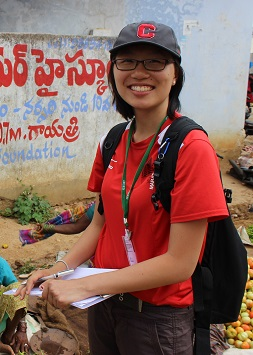 It was exciting to hear the experiences of other members in the team over lunch and on the ride back to ICRISAT. Collectively as a team, we had a more comprehensive overview of the inner workings of a village market place. We will be working on tying up any loose ends and finalizing our survey instruments before beginning our first round of village immersion next week. The adventure continues, stay tuned for updates.